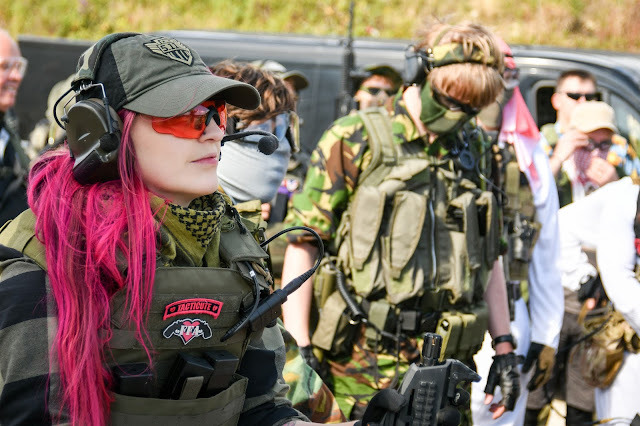 Airsoft has been gaining speed in the world of shooting sports at an enormous rate in the last 5 or so years and with this growth comes an Airsoft presence in the world of events. The very first Northern Shooting Show was held at the Yorkshire Events Centre in Harrogate, Yorkshire and was a mix of real steel, Airgun and ‘The Airsoft Experience’ all in one show. Whilst not the first show of its kind, it has been highly anticipated by the Airsoft community since it was announced last year! The Airsoft Experience was designed to introduce members of the British shooting scene to our sport and the team at Airsoft Action pitched up a tent to show our support! In true Airsoft community fashion there was a varied display to be seen as within the experience we saw Airsoft stores such as JD Airsoft, The Grange, Pro Airsoft Supplies and ASPUK, some of our favourite brands Nuprol and ASG, Stirling Airsoft providing fee taster sessions within their mini inflatable Airsoft skirmish site and a full Practical Pistol course so the punters could try another side to our sport to name a few. There were many highlights of this event – seeing the highly anticipated ASG CZ 805 Bren in person for the first time, checking out some of the new products from Nuprol such as their new range of magazines and testing the latest generation of Alpha Tec Hex Grenade – 2016 is sure to be a great year for Airsofters and their kit. The main highlight of this show for me however was definitely having a taster session of Practical Pistol with the team at the Grange, and dare I say it, since I’ve been trawling the internet looking at competition pistols and shooters belts – all in the trademark pink! (Shifting the blame onto you there Herman!) What I love about this side of the sport is that Practical Pistol is all about accuracy and speed, and the loadouts! They are brightly coloured and completely different to the Skirmish aspect. I enjoyed this so much I definitely think it will definitely become a new addiction for sure! As well as the Airsoft experience skirmishers could try their hand at new activities such as clay pigeon shooting, archery, plinking, shooting real steel .22s and also attend gun safety talks. Overall, the Northern Shooting Show was a resounding success, with tickets priced from £9 per day the event was great value for money! It was great to catch up with old friends and make new ones! Although I would’ve liked to have seen more retailers and brands at the show, it was great to see such a large Airsoft presence and try new aspects of our sport/hobby, and experience what the rest of the shooting industry has to offer us. I anticipate that the turn out next year will be even better! Here’s to the Airsoft Experience 2017! Hardwick, K. (2016). The Northern Shooting Show. Airsoft Action. 63 (July), 31. LOCKED UP! THE GAOL SITE REVIEW!